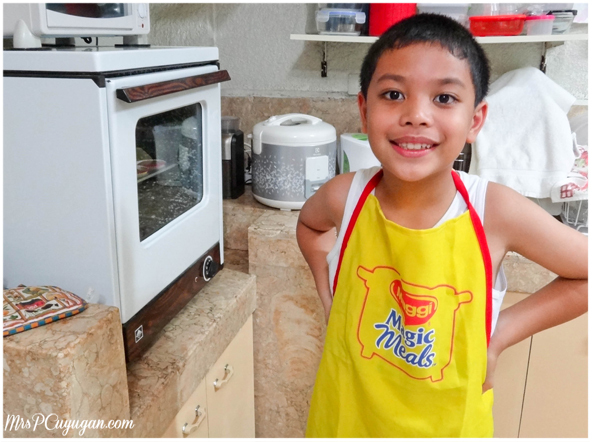 Have you ever tried baking with Swiss Miss? As in the hot chocolate mix? Me neither, until yesterday. I decided to make peace with our 20+ year old oven by attempting to bake a nice snack treat for Little MrC. Since it’s exam week, he’s home way before lunch time, so this week is filled with more mommy time than WAHM time. I could see he was getting bored with his usual afternoon cartoons. Blame it on him being stuck at home with a fever over the last 5 days. Because Cartoon Network and Toonami weren’t doing their usual magic, I had to think of a quick activity that we could do. And so, I went ahead and cranked up the heat on our old-timer oven. Bahala na if the temperature on the right is hotter than the temperature on the left. Lol. Making this kid work for his food! 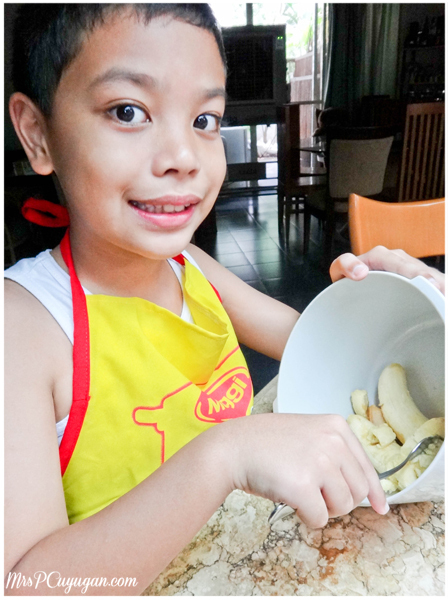 I got the little boy all excited about mashing bananas, put an apron on him and set him to work. I realized too late that I should have checked that I had everything we needed in the pantry before I involved the little boy. 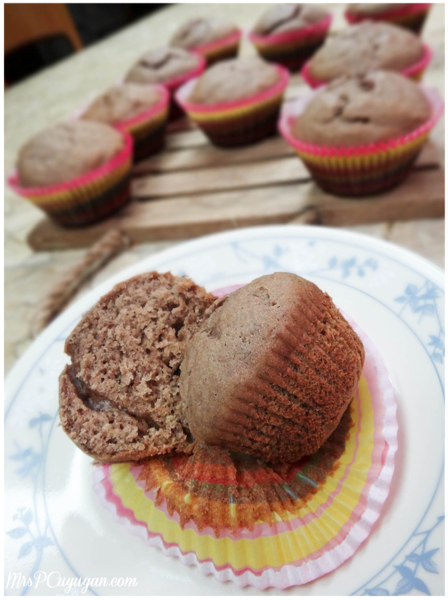 The original plan was to make choco banana muffins like these ones by Nigella, but using tablea instead of cocoa powder. Toinks, my stash of tablea apparently went bad in the freezer during that Glenda storm, and my mom had gotten rid of them already. We also didn’t have any cocoa powder. 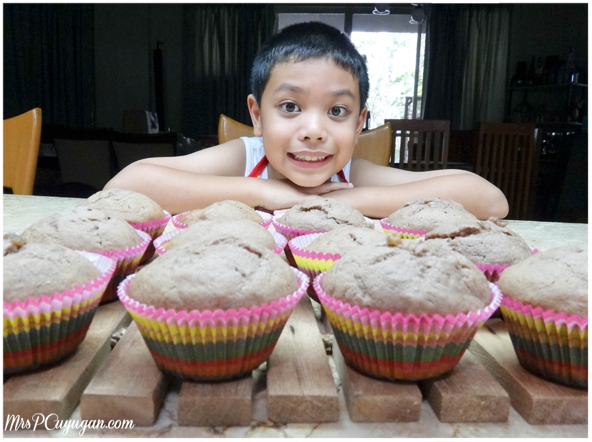 I could have just gone with plain banana muffins, but I already said chocolate (the magic word) to the little boy. I had to think fast. I decided to use Swiss Miss. The dark kind. They came out yummy. There’s not a lot of sugar in the recipe, so the sweetness comes mostly from the bananas. The riper the better. I like to use the nearly rotten ones for baking. Those are the best. The end result was not as chocolatey as it would have been if I used proper cocoa, but for a quick meryenda fix, a fun bonding afternoon with my kid and quick snack box fillers for today, these are more than good enough. Preheat your oven to 400°F. Line a 12-cup muffin pan with paper liners. The cuter the better! Mash the bananas to baby food consistency. With an electric mixer on low (or by hand), combine the mashed bananas and vegetable oil. Add in the egg and sugar. In a separate bowl, sift together the flour, Swiss Miss and baking soda. Gently add the dry mixture to the banana mixture. Do not overmix! It's totally fine if your batter is lumpy. Spoon batter into the prepared muffin cups. I use an ice cream scoop for this so that I get relatively uniformed muffin sizes. Bake in the preheated over for 15-20 minutes. These should rise significantly and become a nice shade of cocoa brown when done. Cool the muffins slightly in the pan before removing to a wire rack to cool completely. This tastes super awesome topped with fruit preserves or with cream cheese frosting. Swiss Miss Muffins? How very very interesting. I’m definitely going to take note of this one once I get myself a decent oven! Ms. Patty, what brand of oven are you using? I’m definitely trying this out. Parang I wanna try it with their Swiss Miss chocolate mint also. The muffins looks delicious. I want to try this one too. How nice of your son to help you in the kitchen. It’s also a great bonding moment for the two of you:) Question: what happens if a banana that is not over ripe is used? A very interesting recipe. It sounds.. and I’m sure it tastes delicious! would love to try it soon. thanks for sharing! Thanks, Joei! I’m happy that they turned out okay hehe. I know! It pays to always have Swiss Miss at home, apparently hehehe. Great innovation on your part to change up the recipe so that you can make the muffins. I’m sure he loved eating it as much as making it. I’m sure you two will have the best time! For the recipes, I use a WordPress plugin called Recipe Card. Migrate na to WP! Hehe!